I now have Magical Towels. Jealous? Do you want to know what makes them magical? Well. let me tell you why I needed magical towels. I was looking for a solution to my husband’s paper towel issue. I used to wake up thinking he would wrap me in paper towels. You see he is one of those people that uses four paper towels for a tiny spill. He uses paper towels to wrap things. He uses paper towels to line drawers. He is a paper towel waster. He is so bad I began dreaming that he wrapped me in paper towel to keep me fresh like the veggies. Then something worse than having one million paper towels happened. My husband found the white rag. Yes, the white rag. I know have a pile of those on my counter. You know because they can be washed. They are nasty looking. They take forever to wash, dry, and then fold. He also uses three or four of those for every spill. He also doesn’t use them in a specific way so these white rags may have cleaned a tire and now he wants them to clean the counter. I said, enough is enough and I found the magical towels. Do they clean up spill themselves? No, they do not. They are around $4.00 a roll but get this each towel can be used up to 100 times! How do you say in your best-amazed voice? How can you use one towel up to 100 times? That means with this roll of 25 towels that is the size of a “normal” below average paper towel roll you can get almost 2,500 sheets. Magic! I solved your paper towel storage issue, your budget issue, and your need to be able to clean up using something that is friendlier to the environment. The perforated towels are rayon made from bamboo. The towels are super strong. You use it, wash it under the faucet, and let it dry! Then you use it again. You see you will never have the need to grab 4 conventional paper towels or the crazy white rags. So save the trees because bamboo is easily renewable it matures quickly, takes up less space, uses less water than trees, requires 0 pesticides to grow, and reduces soil erosion, it also reduces greenhouse gases. They can be used to clean the kitchen, bathroom, carpets, upholstery, and messy faces and hands. They even work on the sticky juice that spilled on the floor by someone invisible since no one knows who did it! You can now be a magician too! Choose NatureZway™ Products! NatureZway™ Is Helping Protect Consumers and the Environment with Eco-Friendly, Chemical-Free Cleaning Products Made from Bamboo and other Naturally Sustainable Materials. You can win your own magic towels and other fantastic products. 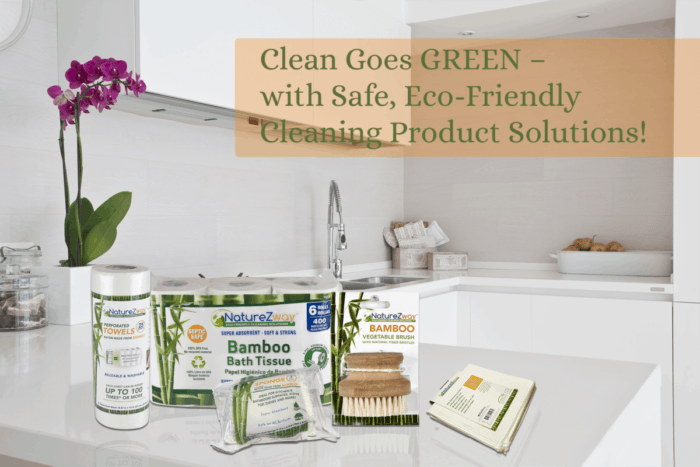 Win Eco-Friendly Cleaning Products from NatureZWay! Giveaway is open to US only and ends on Feb 28, 2019 11:59 pm EST. Going green has never been easier, safer with eco-friendly cleaning products from NatureZway. We all know that our world, environment and home is filled with toxic chemicals. NatureZway is dedicated to help make the world a better place for you and your family. NatureZway products are available at www.naturezway.com and at Amazon.com and grocery stores nationwide! This is a sponsored post on behalf of NatureZWay but all opinions expressed here are mine.